So far no cure for Alzheimer's has been found, but there has been a huge amount of research on the subject over the last 15 years, which has led to drugs that can treat some of the symptoms. There are also hopes that new avenues of research may, over the coming years, lead to potential treatments and even means of prevention of Alzheimer's. In a symptomatic patient, doctors need to take a full history, perform a physical examination, test the blood, urine, neurological and psychological function, and do a brain scan. With the results, an experienced doctor can diagnose Alzheimer's with up to 90% certainty. But the only way to make the definitive diagnosis is by examining the brain on autopsy. Scientists have been investigating the possibility that other tests may, in the future help us to diagnose Alzheimer's even before the symptoms start. For example, more advanced brain scan technology may help to show the plaques and tangles that are characteristic of the disease, even before they start to affect brain functioning. Spinal fluid is the name given to a small amount of liquid that the brain effectively floats in, and which also circulates up and down our backs, surrounding the spinal cord. It can be sampled quite easily by inserting a needle into the small of the patient's back, a procedure similar to the one used to give an epidural to a woman in labour. It is far easier to get hold of spinal fluid than it would be to sample a bit of brain in a living person, so it is examined for clues as to what's going on in the brain in a number of illnesses such as meningitis and multiple sclerosis. Recent research has shown raised levels of certain proteins (called beta amyloid and tau) in the spinal fluid of Alzheimer's patients. In the future, spinal fluid testing may become a useful and routine test for identifying early Alzheimer's. Some results from recent studies suggest that Alzheimer's onset may be delayed or its progression may be halted by some existing drugs, such as cholesterol lowering medication, anti-inflammatory drugs, antioxidants and oestrogen. But study results have been conflicting, and most scientists agree that it's early days yet for these possibilities, and that they are really just good starting points for more and larger trials before we can say for sure that any of these drugs can really delay Alzheimer's. The "use it or lose it" school of thought suggests that the more you challenge your brain, the more you'll be able to maintain it. According to this, the greater the mental stimulation, the more connections will grow between your brain cells, and the more of those you have, the longer your brain will function well, even if you do develop Alzheimer's. Indeed, studies have shown a correlation between participation in mentally stimulating activities like reading and doing crossword puzzles and reduced Alzheimer's rates. It has been suggested that repetition might improve cognitive skills, so that they are less susceptible to damage. But sceptics point out that it's impossible to sort out cause from effect. Alzheimer's might stop people from doing mentally stimulating activities, because the disease itself makes them harder to do. Having said that, most doctors do recommend that we try to stay as mentally active as possible as we age. They also recommend forward planning for our later years, and trying to keep socially connected, as isolation is known to contribute to unhealthy aging from every perspective. 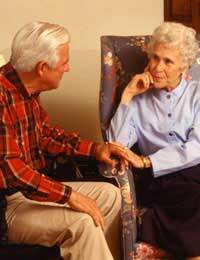 The first effective treatments of Alzheimer's to be found were a type of drug called cholinesterase inhibitors. They include Aricept (donepezil), Exelon(rivastigmine) and Reminyl (galantamine). Cholinesterase is an enzyme (the chemical equivalent of a pair of scissors) which chops up a neurotransmitter (a chemical messenger for brain cells) called acetylcholine. Cholinesterase inhibitors stop the enzyme from chopping, leading to larger amounts of acetylcholine. If Alzheimer's is in early or middle stages, then these drugs may slow down symptom progression. But doctors don't agree about whether or not these drugs slow down the course of the illness. Those who think they do, point to studies that have shown that patients on cholinesterase inhibitors tend to end up in nursing homes later than patients who didn't take these drugs. Another drug called Ebixa (memantine) may work as an Alzheimer's treatment by blocking activity of glutamate, a chemical that may be overactive in the Alzheimer's patient's brain. It is used in moderate to severe disease, and it may not work for everyone. If the onset of Alzheimer's symptoms could just be delayed for about 5 years, then the number of cases in the future could be halved. Scientists hope that research will lead to ways of effecting this delay, slowing the disease down in those who are already symptomatic and identifying those at risk of developing Alzheimer's disease, so that they can be targeted with the new Alzheimer's treatments that everyone hopes will soon give hope to sufferers from this devastating condition.